Reckoned as the highest and amongst the toughest marathons, the Ladakh Marathon challenges even the highly skilled adventurers. 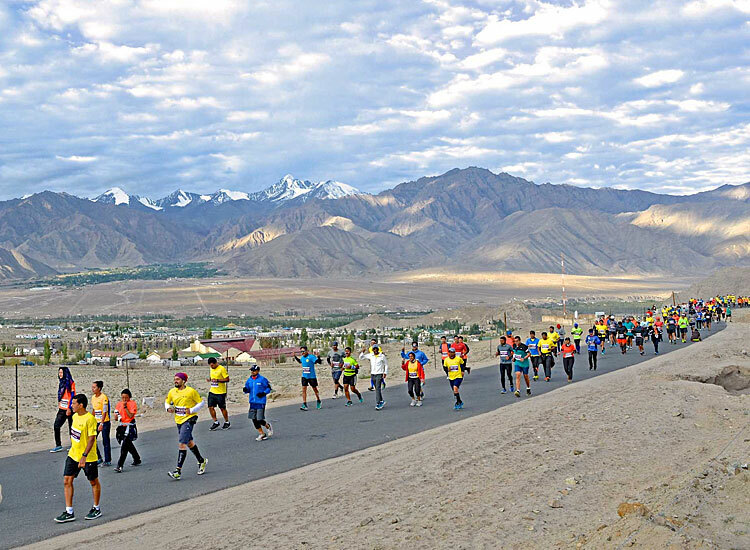 Comprising of 4 inspiring races that take place in and around Leh, the marathon pacifies your adrenaline rush. As a matter of fact, this enthralling activity offers runners the unique opportunity to run with local Ladakhis. Crisscrossing the most beautiful landscape while marveling at stunning vistas of mountains, rivers and valleys help you curate lifelong memories. Listed as being amongst the world’s most beautiful, breathtaking and awe-inspiring marathons, the daring task tests the limits of human endurance. Out of the 4 races, the Khardung La Challenge (5370m) is the World’s Highest Ultra Marathon. Knowing this fact, makes even the daring souls sweat. It is important to realize that unlike other marathon events in India, the event requires you to acclimatize in advance. For this reason, participants need to arrive in Leh at least a week before the actual day of the race. Surprisingly, the Ladakh Marathon had been luring adventure enthusiasts since a long time. This year, the Ladakh Marathon 2019 will mark the 8th edition of the event. 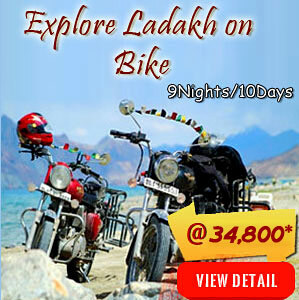 Read on to know some other interesting facts about the exciting activity that makes Ladakh synonymous to adventure. When and why did the Ladakh Marathon start? The history of the Ladakh Marathon is 7 years old. The initiative was started with a motto to make the world realize that Ladakh has made a comeback after devastating floods of 2010. The enthralling activity further motivated the youths of Ladakh to live a healthy lifestyle. Taking up running in the hostile weather was the challenge to be conquered. The most preferred marathon race in Ladakh further created awareness amongst the natives for the need to protect the environmentally fragile area. Fabled to be the highest marathon, the Ladakh Marathon features races that take you to the amazing heights. As a matter of pride, Ladakh Marathon became a full member of Association of International Marathons and Distance Races (AIMS) in 2015. Also, various International Sports Magazines have listed this popular adventure sport in Ladakh in their respective editions. Who organizes the Ladakh Marathon? India’s Rimo Expeditions together with the Ladakh Autonomous Hill Development Council (LAHDC) organize the Ladakh Marathon. Moreover, the event is recognized by the by the Association of International Marathons and Distance Races. Besides this, Jammu & Kashmir Police, the Indian Army and tourism ministry of Jammu and Kashmir support the Marathon. Shortest amongst all the events, the 7 km Run Ladakh for Fun race witnesses participation from runners across the world. Besides this, the race also lures almost everyone including elders, students, families and armed forces. Although covering a short distance, the task is not easy at all. Hydration Points: There will be 2 hydration & aid stations providing water and energy drinks en route. While participating in Half Marathon, you’ll be completing a loop that passes through Leh and has same starting and ending point. Also, touching the outskirts of the town, the half marathon race in Ladakh commences and ends at the NDS Memorial Stadium grounds. Offering the desired warm up before the big race, the half marathon is really tough. Despite being comparatively shorter than the full marathon, the race follows an exciting route which is full of surprises. Hydration Points: There will be 8 hydration & aid stations providing energy drinks, water and bananas en route. Many adventure lover’s dream of the Ladakh Full Marathon which is tagged as the world’s highest AIMS-IAAF certified marathon. Delight in a memorable run under the clear blue sky inspiring you to aim high. Soak in the bliss of scenic monastery. Marvel at the breathtaking landscape that will take away all your weariness and make you feel energetic again. 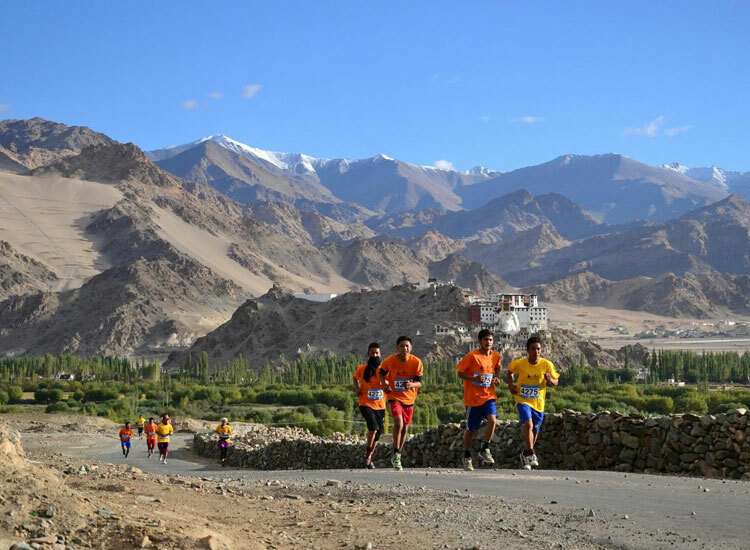 The Ladakh Full Marathon is for all the long distance runners out there. Hydration Points: There will be 14 hydration & aid stations providing energy drinks, water, bananas and snacks en route. If you have the guts to run on the world’s highest motorable road then you must take up the Khardung La Challenge. Beginning from beautiful Khardung village and making its way up to the Khardung La, the race grabs the attention of the elite runners. Furthermore, counted as the highest ultra-marathon in the world, the heart-throbbing event pushes runners’ limits to the extreme. Owing to the difficulty associated with it, the race is only for the very experienced and fittest runners. In addition to this, the harsh weather condition raises the difficulty level. Surprisingly, the event has been titled as the ‘Mother of all the Marathon races’. Note: The race restricts the count of participants to a maximum of 150 runners only. Prize: Runners will get a certificate depending upon the stages conquered by them. All the finishers will get a certificate with official time and a medal. Hydration Points: There will be hydration & aid stations after every 5 km. Runners can get energy drinks, water, snacks, hot drinks, energy bars and bananas from here. Apart from these points, there will be mobile units offering snacks and drinks. Avid runners should save the Ladakh marathon dates in order to take part in the event. Runners must ensure that they are eligible for the races before completing the Ladakh marathon registration process. A fee is charged from the participants for the registration which will start from March 2019. Initially, the Ladakh Marathon in 2012 received 1,500 participants. However, the event is observing a huge hike in the count of participants every year since then. In 2013, the marathon grabbed the attention of 2,200 runners whereas 3,000 adventure participated in the year 2014. It is no wonder that the race held in 2018 welcomed 6,000 participants from 23 countries. Given these points, it can be said that the Ladakh Marathon 2019 will attract more elite runners. Since you will be running at a height of 11,500 to 17,600 ft., acclimatization becomes the foremost issue. The best way to get acclimatized to such a height is to reach Ladakh a few days before the race. Apart from this, here are some tips that will help you during the marathon and as well as your stay in Ladakh. Follow the pre-marathon work-out schedule. Keep camphor with you. It will help you when you feel devoid of oxygen. If participating in Khardung La challenge, reach Leh two weeks before the race day. Take complete rest on day 1. It is important that you keep yourself hydrated. In order to do so, carry plenty of water with you. Carry proper clothing with you. Don’t forget your hydration pack. Keep antiseptic creams, sunscreen lotion, antibiotics, etc. with you. Partaking in the Ladakh Marathon is definitely the best thing to do in Leh. Take up the challenge before it’s too late. 2 comments on "A Complete Guide About the Ladakh Marathon – The Highest in the World"
Please correct distance for Khardungla Challenge to 72 Km. Also start and finish point for 7Km run, Half Marathon and Marathon is NDS memorial stadium. Thanks for the information! We have already updated the same. Keep on reading our blogs for more such posts in the future.